January Crowds at Disney World can be a mixed bag. You kick off the new year at Walt Disney World with the largest crowds normally over New Years. But then the holidays are over the parents are reluctant to pull kids out of school again in January since the kids just had the holiday break off. So some days in January can have light crowds at Walt Disney World. Of course if you do plan on going into the Disney parks on a RED or ORANGE WDW Crowd Calendar day, be sure to set your expectations, have your Disney Fastpass+ rides reserved, and enjoy the little details at Disney instead of planning on riding everything. Again the key to avoid Disney World January crowds is to go on the off season days. Avoid the holidays and plan your Disney World vacation for mid to late January. If you are vacationing on a January holiday in Disney World, make sure you use Fastpasses, have a plan, have Disney dining already reserved, work with your Disney travel agent, and use the free resources here to help get the most out of your vacation dollars. 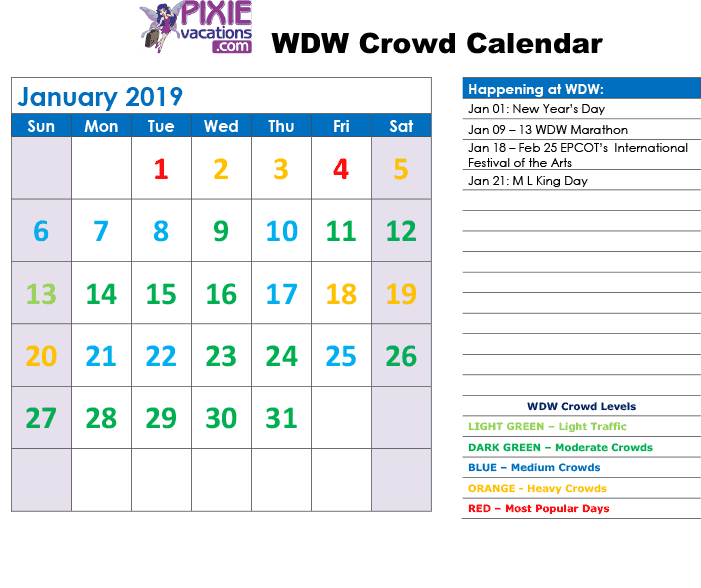 Disney January crowds are mostly light and that is why you will find some special events happening at Walt Disney World in January to try and bring more guests to the Disney resorts and parks. The main January event is the Walt Disney World Marathon. The Disney Marathon is a very popular event and different races take place all year long. The January Disney World Marathon happens the second week of January 9-13, 2019. The great thing about the Walt Disney World Marathon is that is really does not impact park attendance numbers that much. Most runners are at Disney World to participate in the races that happen very early in the morning and they don’t really spend time in the parks. So I would not move a Disney Vacation that happens during a Disney World Marathon. Just be aware some Disney Resort roads will be closed if you are one to head out for a drive very early in the morning. Several of us have done the Disney Animal Kingdom 5k. Our goal was to not be last, and we obtained that goal. The 5k was fun to do, but it was really cold starting in the Animal Kingdom Parking lot before the sun comes up. You do get to see some back stage areas, meet Disney Characters and have fun with other Disney fans.